VeryDOC Flash to GIF Batch Creatoris a useful desktop tool which can be used to produce GIF animation. VeryDOC Flash to GIF Batch Creator is an easy-to-use software application, which can be used to batch create GIF from flash games, flash cards, flash cartoons, or flash animations. Key features of Flash to GIF Batch Creator: 1.Allow users to batch create GIF from flash games, cartoons, cards, animations, etc. 2.Allow users to set width and height when batch create GIF from flash games, cartoons, cards, animations, etc. 3.Allow users to preview the flash games, cartoons, cards, animations, etc., before they batch create GIF from flash. 4.Support all Windows Operation Systems including Windows 2000 and later systems, both 32bit and 64bit systems. 5.Support GIF frame rate setting. 6.Support drag and drop. 7.Allow users to remove all the added files in the list box at one time by clicking a button. 8.Support interval time setting and GIF replay time setting. 9.Users can try the free version of VeryDOC Flash to GIF Batch Creator for 20 times. 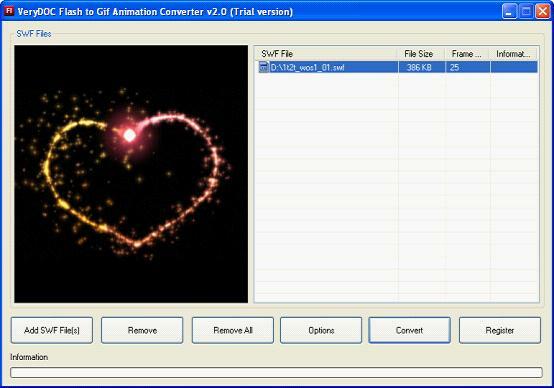 VeryDOC Flash to GIF Batch Converteris a useful desktop tool which can be used to produce GIF animation. VeryDOC Flash to GIF Animation Converter can be used to convert flashes to GIF animation files or SWF to GIF animation files. This site does not contain serial number, crack, keygen Flash to GIF Batch Creator serial number : serial number is the simplest type of crack. A serial number(cdkey,product key,etc) is register the program as you may already know. a crack or keygen may contain harmful software. If you cannot find the exact version you want, just give it a try. for more information read .nfo/.txt/.diz file include in zipped file.